Blooming Villages, Chalk Cliffs and Strawberry Fries. Paris, Boulevard de Sébastopol, 90 F at 9 pm. Neon lights, music, screeching tires, warm asphalt, spices in the air. We just arrived. For us Paris is the starting point of our road trip across Normandy. After a short night in the hot capital of France, we are going to pick up our rental car on the next day. Although the comfortable Thalys-train runs from Ruhr Area in Germany straight to Paris in round about four hours, we feel like our heads were exploding. The hotel we booked was flooded, so we had to rattle spontaneously across Paris with our entire luggage, where we now reside above a dubious Persian restaurant. It doesn’t matter. I’m pouring cold water in my throat while Alex – my boyfriend – is eating a hot crepe in a streetfood restaurant. It’s now 10 pm and still 85 F. Colorful villages, historical castles and ruins, crooked half-timbered houses and strawberries instead of chips are awaiting us in the upcoming days. In love with poppie fields! We take our little red Fiat 500 and start off to Rouen. 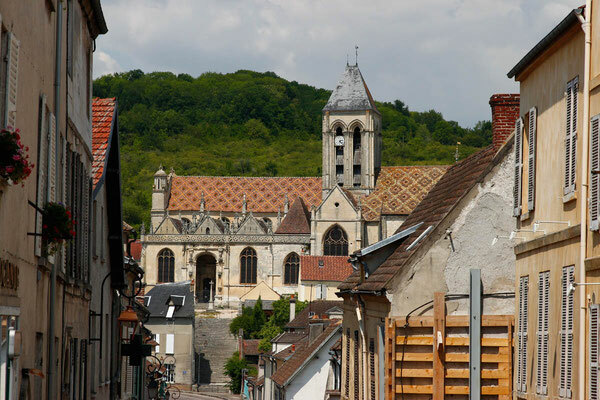 As the capital of Normandy region, it is one of the lager cities in a very rural area. “What the hell! 300 miles and eight hours?” I yell while we are trying to find our way through the mad traffic of Paris. Nonsense. 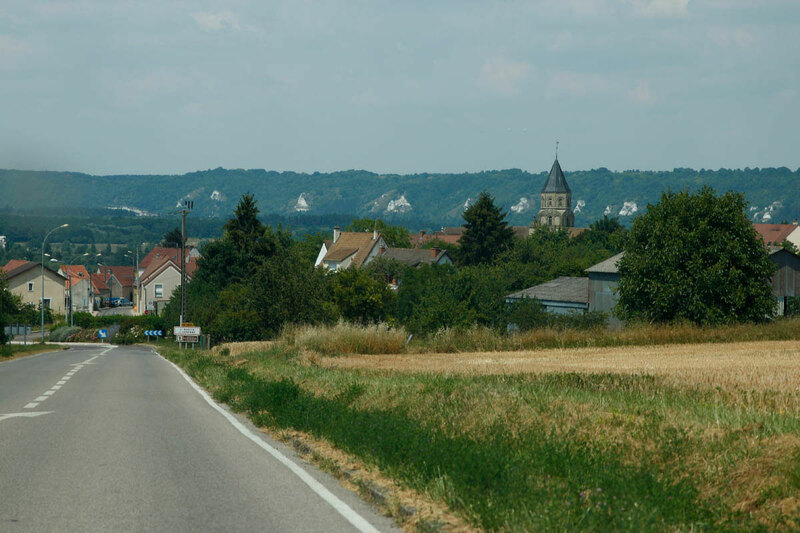 It was just our GPS thinking we were still in Germany. Soon it is showing the correct route from Paris to Rouen. On our road trip we are trying to avoid noisy highways and take small country roads instead. I’m celebrating silently when we made it out of Paris without taking use of the fully comprehensive insurance. 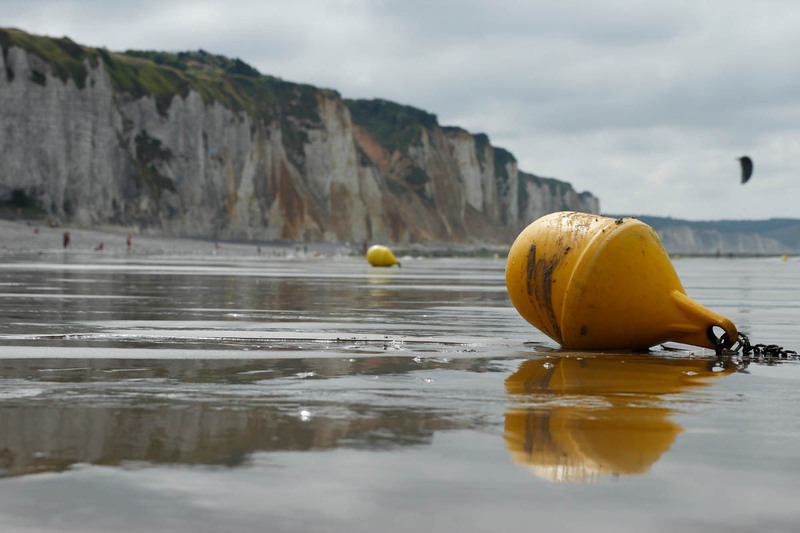 In France 99 percent of all cars are in some way dented, scratched or completely destroyed. The people just don’t care. But our rental car service would. 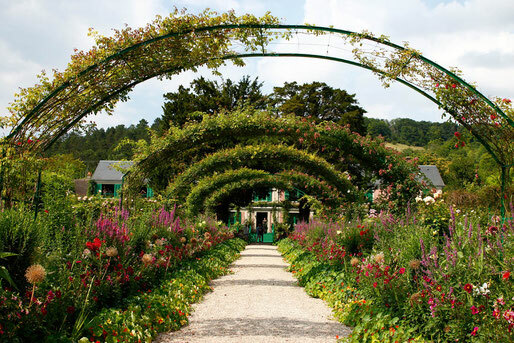 Soon, light brown houses made out of large blocks of stone with blue wooden windows and pink hollyhocks are passing by. Again and again the Seine shows up between blooming hedges. The architecture is a charming mix of Italy, Belgium and the Netherlands. And someone with a watering can let rain magnificent churches and chateaus over every village while the roadsides are decorated with hanging baskets at all the beautiful lanterns. Attention of the details takes on a very special meaning here. Unfortunately the sun is still burning like in the Sahara and we are dying once again. This time on a terrace of a cafe in the shadow of a castle ruin with a $4-coke. Besides, no one here is able to understand English. If that’s world language, we’re on Mars. The next day we are exploring Rouen. After I took 800 pictures of our car in the parking lot near the city to prove that it was intact before we were leaving, we fall headfirst into deep alleys of colorful half-timbered houses. Red bars with yellow windows, orange wood with light blue lanterns. In between are awesome bakeries, cobblestone pavements and cathedrals with dark entrances like artificial caves. 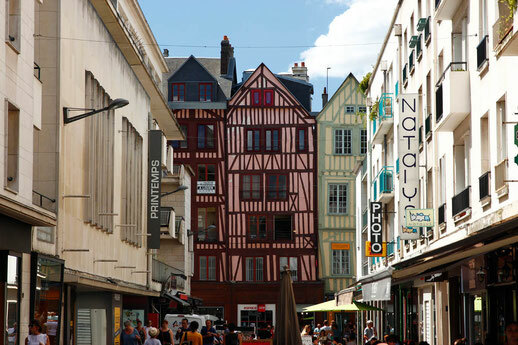 Rouen has about 110,000 inhabitants and already existed rudimentarily in Roman times. 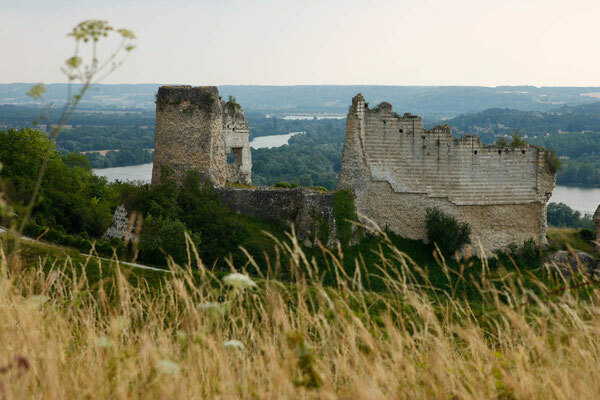 The most famous person is the French national heroine Jeanne d’Arc, who was burned here in 1431. At the market place where we are having pizza tonight. Ironically, mine has a burned crust. If you are planning on a trip to Rouen, leave your map at home. It’s fun to just roam around and discover the narrow and beautiful alleys. Dead feet included. Also very impressive are the big golden clock tower and the Cathedral of Rouen, which was even too huge for my wide-angle lens. But you don’t need more than one day for your explorations. 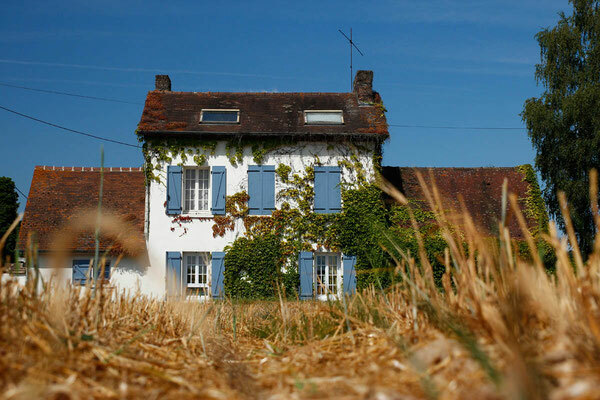 So we soon are driving out to the countryside to follow the winding Seine through cornfields to Jumièges. 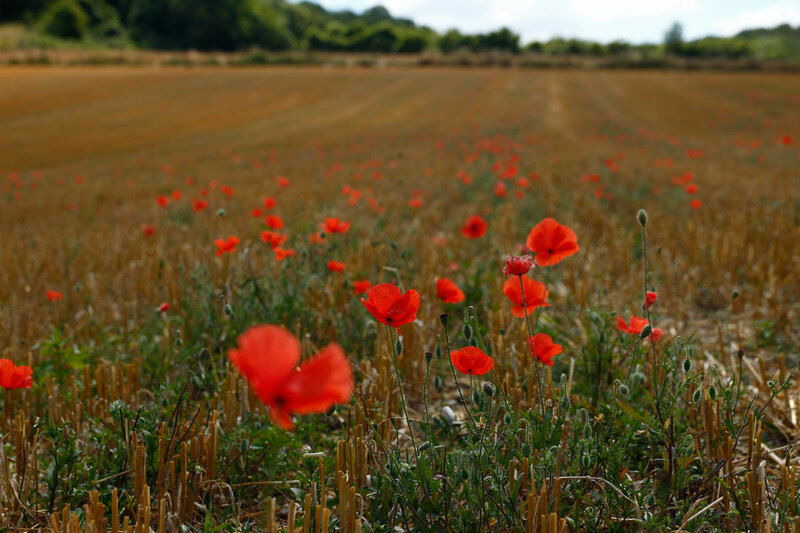 Past deep red poppies, golden ears of corn and dark green grass. 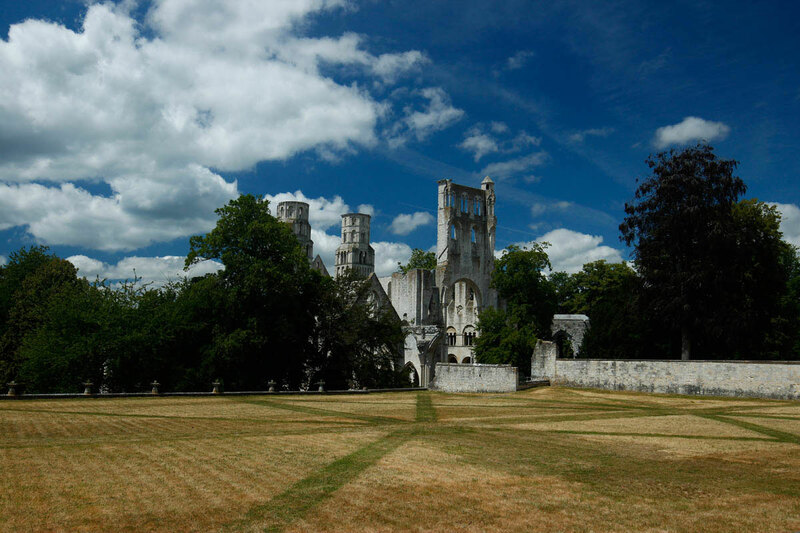 In Jumièges there are the ruins of an impressive abbey that was destroyed during the Religious Wars and was even used as a stone pit during French Revolution. The revolutionaries probably didn’t know about TripAdvisor yet. The massive towers without spires are stretching into the blue sky. The roofs are missing in all buildings of the complex. The ground is covered with meadow and some columns are lying around broken. And yet the remains show a majestic power in whose presence I fell like an ant. Sometimes it is difficult to imagine the crazy dimensions of buildings that crazy humans have created. Without cranes or hammer drills. Above me some pigeons are cooing and a white feather floats down. Peace in the ruins. We are throwing our stuff in the suitcases and the suitcases in our car. We’re traveling on again. To the seaside. To Étretat. The hot air gets cooler and still nobody damaged our car. It could be worse! 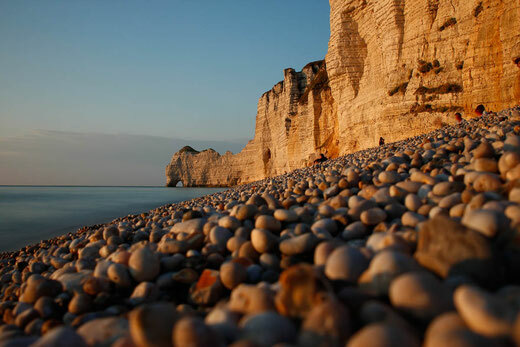 By driving over a hilltop in Dieppe I can see the turquoise water reaching to the horizon. I am as excited as a kid. As usual when I get close to the coast. Waves, seagulls, beaches, love. Étretat is a small seaside resort with round about 1,400 inhabitants. It looks like a Frisian village in Germany with small restaurants, bricks, flowers and fishermen. But the idyll is surmounted by the massive chalk cliffs that line a large part of the Normandy coast. 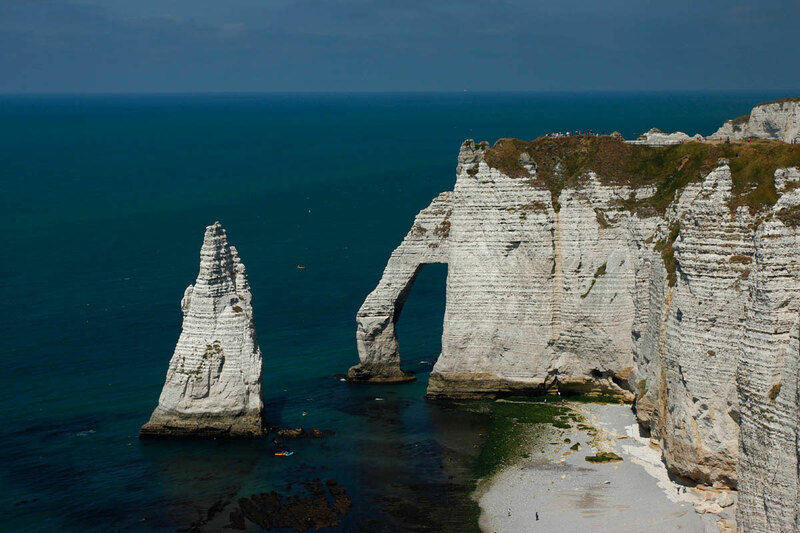 In Étretat, however, they are especially beautiful – because erosion has milled three fabulous arches into the white rocks. Green waves are crashing against the 230 feet tall cliffs. I’m pulling the salty air deep in my lungs while pebbles are crunching under my feet. We are hiking the rocks for a whole day and our faces get burned unnoticed under the strong winds and the hot sun. At the end we’re back at the promenade. Tired and hungry. I’m longing for fries. Alex orders a crepe with caramel and I say “Fries please!” Big mistake. Never expect anyone out here to understand you. Not even in popular tourist destinations. The guy is putting two crepes on, then shovels – to my horror – strawberry jam into one of them to hand it to me. “Fries?”, I mumble exhausted by looking at Alex. On the glass of the jam we can read “Fraise”. The French word for strawberries. After I have discontentedly messed around with the sweet stuff and after we have beaten away some more time, the sun finally sets and paints golden and white stripes on the steep slopes while the tide is rolling in. The water is tearing the big pebbles on the beach back into water. I listen to the sound until the glowing red ball disappears on the horizon between smoky clouds.